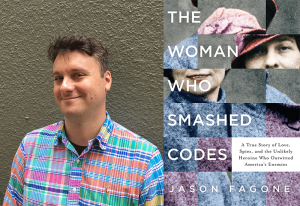 Jason Fagone, author of The Woman Who Smashed Codes: A True Story of Love, Spies, and the Unlikely Heroine Who Outwitted America’s Enemies (Dey Street Books), which was was selected to the 2018 Notable Books List for nonfiction, has been added to the stellar panel of this year’s Literary Tastes event at ALA’s Annual Conference in New Orleans. Fagone joins authors Kathleen Rooney (Lillian Boxfish Takes a Walk), Thi Bui (The Best We Could Do), Seanan McGuire (Down Among the Sticks and Bones), Alyssa Cole (An Extraordinary Union) and narrator Scott Brick on the panel to discuss their writing (or performance) process, story line development and inspirations. Panelists have been named to one (and sometimes more) of RUSA’s Best of Lists for fiction, nonfiction, poetry and audiobook narration. Attendees will enjoy breakfast and a book signing immediately following the event. Booklist’s starred review raved, “Riveting, inspiring, and rich in colorful characters, Fagone’s extensively researched and utterly dazzling title is popular history at its very best and a book club natural.” The Woman Who Smashed Codes book is only beginning; CBS has announced that is getting ready for the small-screen. Jason Fagone is a journalist who covers science, sports, and culture. Named one of the “Ten Young Writers on the Rise” by the Columbia Journalism Review, he is a contributing writer to the I, and writes for a number of outlets, including GQ, Esquire, The Atlantic, the New York Times, Mother Jones, and Philadelphia Magazine. He is the author of Ingenious and Horsemen of the Esophagus, and lives in Philadelphia, Pennsylvania.